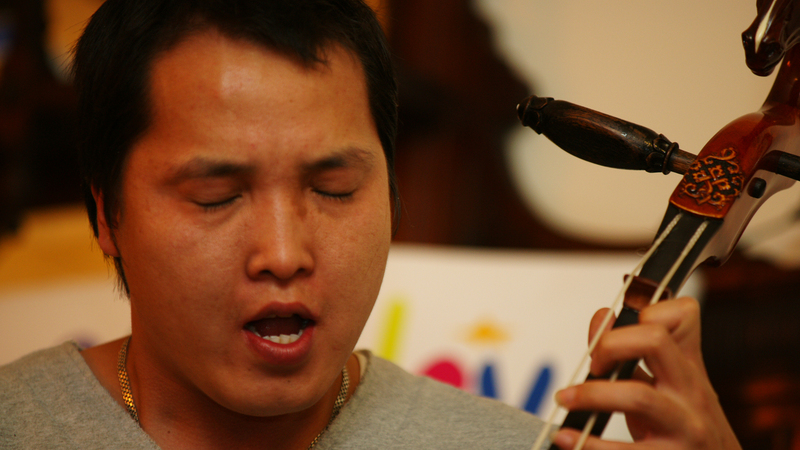 Bukhu began practising the ancient art of Mongolian Overtone Throat Singing and Harmonic Chant at the age of 15, known traditionally as Khöömii (Khuumii or Khoomei) referring to the various forms of overtone throat singing. The sounds of Khöömii are generated by manipulating the resonance of air pushed from the lungs , travelling past the vocal fold and lips to produced a melody. The melody can be selectively amplified by changing the shape of the resonant cavity of the mouth and throat via the manipulation of the tongue and surrounding muscles. This selective tuning generates simultaneous variations of pitch from a single resonant vocal frequency. The roots of Khöömii are steeped in Mongolian culture with origins in Shamanism (Mongolia’s national religion) The modulated overtones generated while singing the base melody convey an ethereal inter-connectedness with the human spirit, nature and nomadic tradition. Bukhu finds renewed energy and warmth through his performance and considers throat singing practices as medicine. Greetings. I am from the US and visiting family in Melbourne. I am a Shuaijiao competitor and I love Mongolian Bokh, hoomi, and shamanism. I tried my best to grasp the hoomii technique but have struggled and i so look forward to my first formal lesson which I planning on going all the way to Mongolia for until a friend told me there was a master in Sydney. It is my dream to be great at hoomii one day and use it for medicine warming peoples hearts. Are you available around the 1st or 2nd? Thanks in advance. I am another who would like to learn throat singing for both spiritual reason s and that it is beautiful. Yes, I am happy to give a lessons. Please send me email, if you need further info. I moved to Sydney not so long ago and would be very interested on learning more about throat singing ? Are you still based in Sydney and teach ? I am a member of the Country Women’s Association of NSW (CWA) .Each year we study a different country and this year our country of study is Mongolia. We will celebrate Mongolia by having a Mongolian lunch on 2nd August 2016 with about 40 invited guests. I would like to extend an invitation to you to join us for lunch and invite you to perform a couple of Mongolian songs for us. Funds raised at this lunch will be donated to our International Aid fund and in turn an amount would be donated to Mongolia. I am interested in taking lessons in Mongolian throat singing I reside in Sydney. Is this at all possible? Hello Bukhu! Let me start by saying I am a huge fan of your singing from all the way over in Western Australia, you have inspired me to start practicing throat singing. I was wondering if you could suggest any good resources to get me started? I wish I could come learn from you in Sydney!